Have you over woken up one day and realized that you were thousands of dollars in debt? This happened to me, and it could happen to you too. Times are hard, and you end up using your credit cards more often than you realize, and before you know it, you’re already reaching your credit limits and you can no longer pay off your monthly balances. Abusing your credit card is one of the major money mistakes in your 30s. But don’t lose hope! The good news news is that it is possible to eliminate your debt by investing your money wisely. 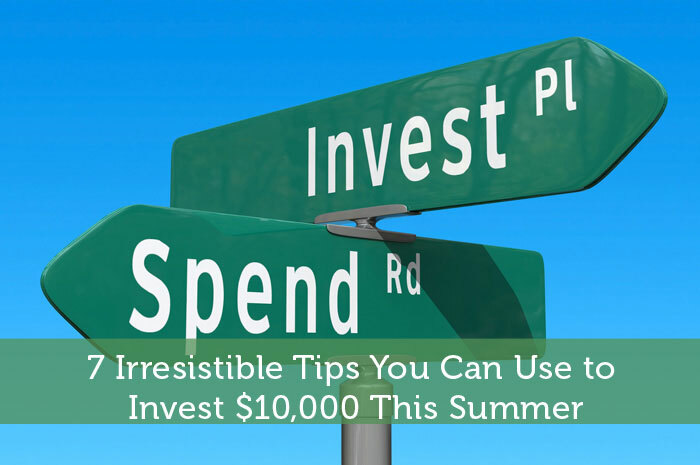 The simple truth is, if you can invest $10,000 wisely this summer, you can get out of debt. Even if you don’t have $10,000 right now, you can tap into hidden income just by looking for ways to ‘eliminate’ unnecessary expenses and actually invest the money and make it grow, instead of just keeping it in low-interest savings accounts. Exchange-traded Funds. ETFs are a tradable security that tracks an underlying asset such as bonds, stocks, commodities, an index or even an index fund. They provide me with a great way to balance my investment portfolio since they are a safer investment that offsets riskier assets like stocks and bonds. ETFs are a passive investment instrument that allows you to automate your money since you don’t have to manage the fund. Index funds. These are an investment instrument that tracks the performance of a particular index such as the S&P 500 and the Dow Jones. An index fund effectively allows me to enjoy exposure to the stocks and bonds included in the index while enjoying nominal transaction and other fees. Gold IRA. Investing in gold and silver helps secure my retirement by preventing the value of my money from being depreciated by inflation. And since I’m using my investment savings to buy the precious metals, I can enjoy the tax benefits associated with an IRA. Mutual funds. These are an investment security in which the funds of a group of investors are pooled to buy a portfolio of holdings which can include cash, stocks, bonds and other assets. These are a great low-risk addition to my portfolio since I don’t have to do any work managing them, since the fund manager does all the work. And I choose funds that have an expense ratio of 1% in order to keep the costs of the fund from affecting my returns over time. Money market accounts. These are some of the best short term investments since they provide me with the flexibility to withdraw from my accounts. And I am also not required to maintain a particular balance in my account. CDs. Certificates of deposit provide an effective counterbalance to money market accounts. Unlike money market investments, CDs have a fixed interest rate that is higher than other savings options. CDs are a good option for where to invest your money since you enjoy the security of a fixed interest rate and a maturity date that suits my financial goals. Online savings accounts. The major benefits of using an online account are higher yields and lower transaction fees, which can increase the amount of returns you can enjoy. To get the highest returns, I look for online banks that offer no maintenance fees and a higher APY as well as a low minimum opening deposit requirement. Of course, I also look at the track record of the institution to ensure that my money is safe as well as excellent customer service. The road to saying goodbye to your loans and debts- be it personal, school, or business, is here. However, before you start to invest your money, I invite you to read 5 Successful Strategies I Used to Tackle $40,000 of Debt. This can serve as a part of your investment training because in that link, you can learn more strategies to help you get out of debt. Keep in mind that the simple money mistake that cost you millions is not starting to save as early as possible to ensure your financial future. Because of compound interest, even putting aside small amounts in a savings account can grow into a big balance over time. I hope my story helped you get started in finding the best place for money to be invested. How about you? What’s your get-out-of-debt story? Did you try the strategies mentioned? If they were helpful to you, please share your experiences in the comments below for the benefit of the other readers. If you have friends you believe need help in getting out of debt, or in building their financial future, feel free to share this story. Bill Achola is a financial publisher who owns a fast-growing, dynamic and innovative investment blog that empowers investors to make the right decision. To see action on how you can invest in your future, check out his popular post about 15 Jaw Dropping Tips for Investing in Gold & Silver. (and maybe learn to earn some profit from your investment while you’re at it).